With cholesterol-blocking plant sterols, neutral-tasting Mazola® Corn Oil is a heart-healthy choice for salad dressings, marinades and more. A clinical study showed Mazola® Corn Oil reduces cholesterol 2x more than extra virgin olive oil. To learn more about this claim, see Mazola.com. 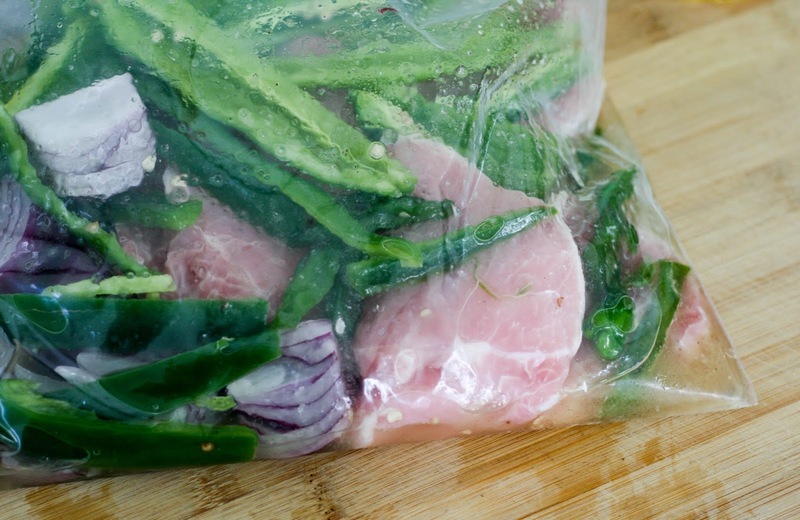 Place all ingredients in a resealable plastic bag or marinating container. Refrigerate for at least 20 minutes and up to 12 hours. 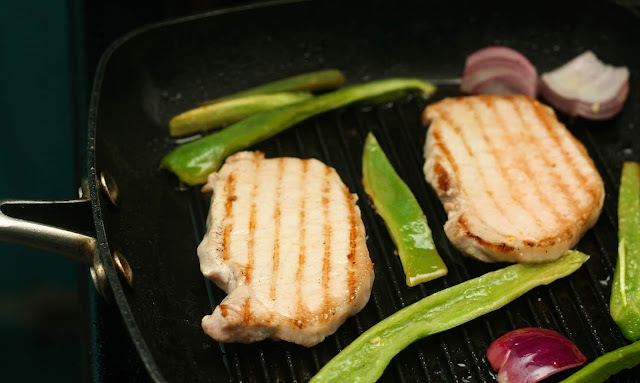 When you are ready to cook, prepare a grill pan according to the manufacturer's instructions. 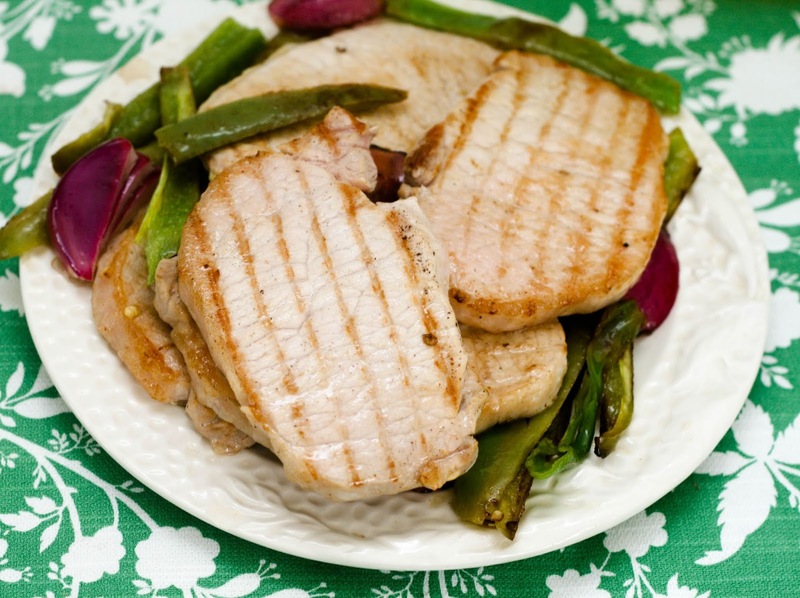 Place the pork chops, onions and peppers on the grill in a single layer and grill 2-3 minutes on each side until fully cooked and grill marks appear. 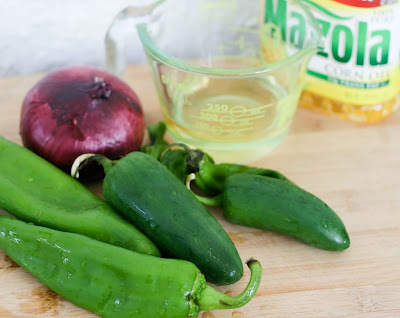 I was pleasantly surprised to learn this fact about Corn Oil, so I thought I'd swap out my usual canola or olive oil in a marinade for Mazola Corn Oil and check it out myself. To keep with the lighter vibe, I created this simple recipe as a spin on the classic sausage with peppers and onions. I swapped out the sausage for lean, quick-cooking pork chops and used three kinds of peppers for flavor instead of using bland bell peppers and spices. These peppers are not only tasty, they are excellent sources of vitamins A and C, potassium, folic acid, and fiber and are low in calories. Another benefit of corn oil I had no idea about was Mazola Corn Oil has a smoke point higher than most cooking oils at 450°F, which makes it perfect for sautéing or in this case, indoor grill pan use. My grill pan gets so hot, it sears the meat almost instantly so using an oil that doesn't burn or smoke up the house is important. Both of us really enjoyed this dish, it was super quick to put together (under 30 minutes including marinating!) and the meat had a ton of flavor and heat thanks to the in-season hatch chiles, jalapeño, and shishito peppers. I love grilled onions and red onions caramelize pretty quickly which added some depth to the dish. The strips of peppers ended up being more like a side dish than a flavoring device in the marinade which I really liked. It made a great make-ahead dish for lunches this week too, my husband packed some up with rice to easily reheat at work and I made sandwiches and salad with the leftovers. You can also double the recipe successfully.